We are proud to announce that the Nuki Smart Lock is the first and only Smart Lock in Europe as of now which supports Google Assistant. Even in the development phase of our Smart Lock, it was our desire to integrate as many systems as possible to give you, the user, the chance to choose your preferred ecosystem. With the integration of Google Assistant, we would like to extend those specific opportunities for you and follow an often requested customer wish. 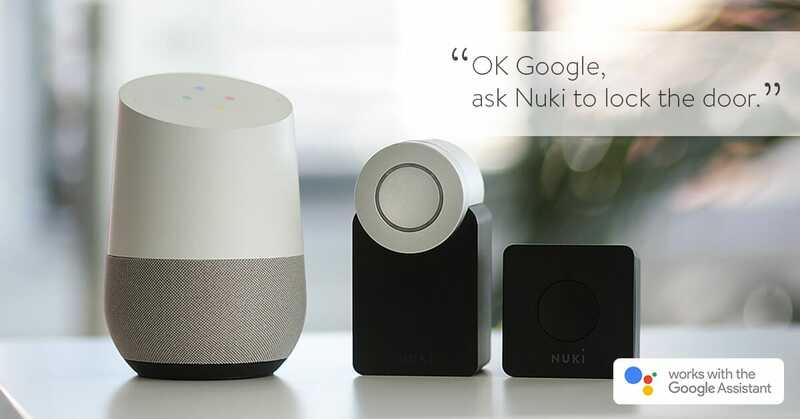 With Google Home we can provide you a further option to control your Nuki Smart Lock from now on, in addition to the Nuki app, the Nuki Web platform and Amazon Alexa. To use the Nuki App for Google Assistant you also need the Nuki Bridge for your Smart Lock as well as a Nuki Web account. Log in with your Nuki Web account and allow Google Assistant the access to your Smart Lock via Nuki Web. As soon as the installation is completed, you can ask Google Home about the current status of your Smart Lock, lock the door or check the activity log. Please note: Unfortunately, Google prohibits the opportunity to unlock or open doors with Smart Locks with Google Assistant. We don’t have influence on this general restriction. In case this will be allowed by Google, we will naturally add this command in a later update.